This item was designed and produced by Tora Magic Company - by Hamed, Tora's son. 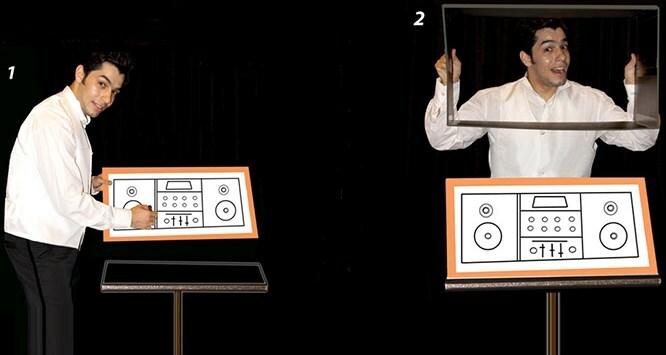 At first, the audience sees a combination of a white board with a picture frame on a table. The magician takes the board and draws a CD player on it. He places his drawing on the table and shows an empty cover. This cover is placed over his drawing. He lifts up the cover and, magically, the audience sees with disbelief that the drawing has transformed into to huge CD player! The magician can show all sides of CD player to the audience. This item included a table, a whiteboard with frame, and a giant CD player.